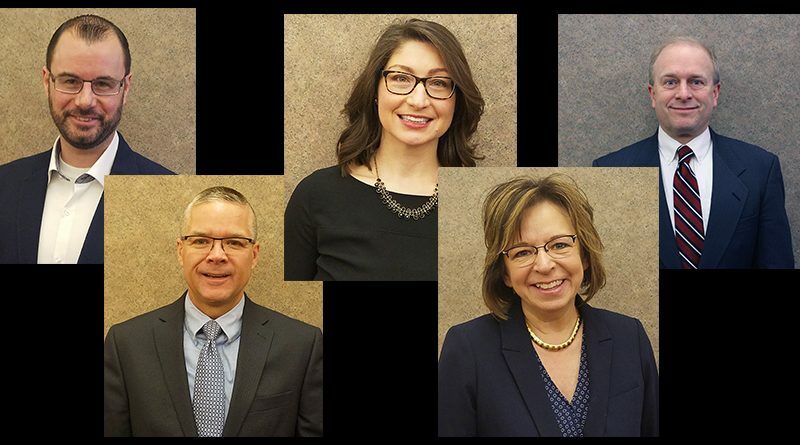 The Portage County Business Council has announced the 2019 officers and board members. The PCBC serves as the chamber of commerce, economic and talent development organization for Portage Co., and is home to Ignite Young Professionals, Ambassadors, and the Heartland Leadership Initiative. The organization prioritizes retention and attraction of businesses and employees for its members. Officers for 2019 include: President Jim Firminhac, WoodTrust Bank; Vice President/Co-Treasurer/Secretary Derek Nest, CliftonLarsonAllen; Co-Treasurer Craig Aittama, Delta Dental of Wisconsin; Past President Deb Marten, Marten Machining; Ray Ackerlund, Skyward; Todd Schroeder, Sentry; Lisa Sobczak, ABR Employment Services and Kelly Zagrzebski, Wisconsin Public Service. Kaitlyn Budd, Ki Mobility’s Vice President of Production. Budd leads a team of customer-focused managers to support the daily production needs of a complex rehab manufacturer. She encourages a team approach focusing on improved process design and a commitment to quality, and knows that consistently exceeding customer expectations encourages trust and buying confidence to build loyal customers. Prior to her current position, Budd was the Director of Systems for Ki Mobility, with oversight of customer service and IT systems. She holds a B.S. from the University of Wisconsin–Madison and a Professional Development Certificate focused in Project Management from Northwestern University. Before joining Ki Mobility, Kaitlyn worked in medical research and animal stranding response. Andrew Halverson is the Executive Vice President and Co-Owner of Ellis Construction. Halverson’s role at Ellis has him spearhead efforts relating to human resources, marketing, workforce development, as well as collaboration with Ellis’ Director of Estimating to lead pre-construction efforts. Halverson also works hand-in-hand with and supports Ellis’ president in running the day-to-day operations of the company. Prior to his current role with Ellis, Andrew served as vice president of business development with the company. He holds a B.A. from the University of Wisconsin-Stevens Point and 15 credits towards an M.P.A. from the University of Wisconsin-Milwaukee. A Stevens Point native, Andrew is married to Shana, a third grade teacher at McKinley School and has three children, Alex, Mason, and Elise. Prior to joining Ellis in 2014, Andrew served as the Mayor of Stevens Point, and also currently serves on two other boards of directors. Craig Aittama is the Vice President of Finance at Delta Dental of Wisconsin. Prior to joining Delta Dental in April 2018, Aittama spent 31 years working in health care. He and his wife Terry moved to Plover in 1992, where he worked as a controller at Saint Michael’s Hospital, and in 2012 was appointed Vice President of Finance and Treasury for Ministry Health Care. Aittama will assume the role of co-treasurer on the PCBC and is also a board member of the United Way of Portage County. Aittama earned his bachelor degrees in accounting and finance from the University of Michigan—Dearborn playing hockey on a scholarship. Craig and Terry Aittama have two daughters, Kara and Lindsay. They enjoy being active in the outdoors and visiting family back in Michigan. JoAnn Rutta is Assistant Vice President, Banking Services Manager for Investors Community Bank. Leading the retail team in Stevens Point, Rutta believes in providing excellent customer service and building long-term relationships. Rutta joined Investors Community Bank in February of 2017, with 10 years of banking experience and 25 years retail management experience. Rutta is the 2019 chairperson of the Portage County Business Council Ambassador Club. Brian Formella graduated from Marquette University with bachelor degrees in English and economics and from Marquette University Law School with honors. After graduating, he was a law clerk to Wisconsin Supreme Court Justice Louis J. Ceci. His areas of practice include employment and labor law, municipal law, environmental law, real estate, and general business law. Formella has a strong legal background in employment, labor, and municipal law. Formella works with employers to establish sound employment practices. He has also aggressively defended employers against discrimination accusations. Brian is married to Amy Formella and they have four children, the youngest of whom attends Pacelli Catholic Schools. For more information on the PCBC, go to portagecountybiz.com.